There will soon be a boom in the U.S. immigrant investment program as the Ottawa government made a surprise announcement to close their immigrant investment program. Canada Closes Its Doors for Immigrant Investors: A Boon For America? In a move that took almost everyone by surprise, last Wednesday, the Ottawa government declared that it would be closing its immigrant investment program for good. This comes after almost two years of a complete standstill in the program, with no visas being issued to any applicants since before 2012. That gridlock led to a backlog of over 65,000 immigrant investor applications, some dating back to as early as 2008. Since the program was halted in 2012, Ottawa had maintained that the program would be opened again sometime in 2014. However, it appears that the pressure to close the program proved to be too great. Unfortunately, for those that have been waiting in line, in some cases for perhaps four years or more, there will be no Canadian Permanent Residency waiting at the end of this road. It is no surprise that the biggest demographic impacted by this bombshell decision is Chinese investors. According to official numbers from the Canadian government, around 45,000 applicants waiting in line were from Mainland China. As we speak, Chinese applicants and the hundreds of immigration agencies all over the country are going over options. In an industry that is far from transparent, Chinese investors that were counting on the program to be reopened are now wondering what direction to go in. Whether they were interested in living in Canada, starting a business, or in most cases, sending their child to school, their plans that had been many years in the making will have to be altered. Just south of Canada, though, there is another country with its own investor immigration program that looks like the most natural choice for recently rejected would-be Canadian immigrants. The U.S. EB5 program boasts all of the benefits of the Canadian program, and over the next few months we may witness one of the biggest moments in the program’s history. The Canadian and U.S. program differed in a variety of ways, both having merits and shortcomings in comparison to one another. From the mid-90s up until mid-2011, Canada dominated the market. The program had been a $400,000 loan to the federal government, which was returned to the investor without interest five years after making the investment. In 2011, the program was raised to a minimum $800,000 investment in an attempt to slow things down; applications still poured in which led to the 2012 halt and today’s outright cancellation. One of the biggest advantages in the market was that the Canadian program was a no-risk loan to the government, unlike the U.S.’s $500,000 at-risk investment scheme. In a country where trust is scarce, many Chinese flocked to the Canadian program simply because they knew that as long as they could wait in line, the government would guarantee their green card and their money. Since the stall of the Canadian program in 2012, the U.S. EB5 program has started to pick up more and more steam in the Chinese market. In 2011, 2530 EB5 visas were issued to Chinese clients, just shy of 80% of the worldwide market. In 2013, that number was already up to 6895 visas, taking up 81% of the market. That number will likely rise this year in response to the drastic change in Canada. Agents across China that had previously made their bread and butter from processing clients into the Canadian program had started to shift their business models towards including U.S. programs on their docket, and now that trend will almost certainly go forward at a harder pace. In many ways, the U.S. program is an easier and more attractive option for Chinese clients. Although the investment is required to be “at-risk,” it is cheaper in price: $500,000 into a venture that creates 10 jobs, as opposed to the Canadian scheme of investing $800,000 to the government. Plus, the wait times are much more reasonable. The U.S. program is averaging between 15 and 21 months, whereas at best, clients looking to the Canadian market could have expected at least a two to three year wait, if not more. What to watch for in the EB5 program? Many clients will be considering the U.S. program in depth for the first time. One of the most frequent questions I have received in the last few days is “Could the same thing happen in the United States as in Canada?” While there is no guarantee, it seems extremely unlikely that the U.S. EB5 program would suffer the same fate as the Canadian program. The investments, for starters, are very different functionally. As a condition of the visa, the U.S. $500,000 investment must create at least 10 jobs, which is a direct link to actual economic development. The Canadian counterpart was only indirectly tied to economic growth and job creation. The EB5 program, most recently renewed in 2012, was actually one of the few things Congress has agreed to at all in the last few years. It was passed unanimously in the Senate and breezed through the House with only 3 dissenting votes. I doubt in an election year, any politician will risk his or her political future on taking a crack at eliminating EB5. Indeed, what may be more important for clients now considering focusing their aim on the United States is choosing a good American partner for the investment. The Regional Center that our company operates in, the Metropolitan Milwaukee Association of Commerce Regional Center was approved in 2007. At the time, it was the 21st regional center in America. Today, there are over 400! Competition is fierce, and most in the business are newcomers. Now is the time for clients and their agents to analyze projects closely and go with the companies that are committed to building quality, long-term, safe projects. I believe that for whatever reasons the Canadian government decided to close its program, this is a huge opportunity for America. Communities around the U.S. that are most friendly and welcoming to our Chinese friends and other international friends, and have ready U.S. projects to boot, and will gain the most. Dan Redford is the Director of China Operations for FirstPathway Partners, and industry leading EB5 immigration fund manager. He also serves as the President of the Michigan State University Beijing Alumni Club. You can follow him and his perspectives from China athttp://www.danredford.com. We just celebrated Chinese New Year here on this side of the pond. In this China US Focus piece, I give my perspective on what has literally become the world’s largest annual human migration. You can read the post on China US Focus, or simply scroll down for the text in this blog. Happy New Year! Every year in China about this time, the ground starts to shake. Don’t be too alarmed; I’m not talking about an earthquake. I’m talking about China’s most important holiday, “Chinese New Year,” otherwise known as “Chunyun” or “Spring Festival.” Since living in China and experiencing the Spring Festival first hand, I’ve come to prefer another, more descriptive term for this holiday season: the world’s largest annual human migration. In China, it is estimated that for this year’s Spring Festival, there will be over 3.6 billion “journeys” by Chinese people trying to make it home by plane, train, bus, or anything in between. For comparison, in the U.S. a mere 93.3 million people travelled domestically during the 2012 holiday season. Unlike in the West where the year-end holiday season marks a mild slowdown in business and about 10 days off of work, the Chinese Spring Festival puts that to shame. Those 3.6 billion journeys will happen over a period of 40 days, this year lasting from January 16th to February 24th. For foreigners that are accustomed to doing business in China, this can be one of the most frustrating and confusing times of the year. If one is used to returning to their home country for the traditional Western holiday season, it is often just as practical to stay put and “wait out” the Spring Festival time. Even though the New Year’s holidays do not officially begin until January 31st, there is a strong feeling of lethargy that begins in mid-January, creeping up gradually to the official holiday in which all business stops. While it is advisable to avoid trying to do business in China during this time, it is an amazing, albeit hectic, time to witness the complicated mix of wonderment and chaos that is modern China. The reason that the roads and trains are so crowded with people is that millions upon millions of people across China’s biggest cities are considered waidiren, or “out-of-towners.” According to the China Labour Bulletin, around 260 million Chinese farmers have moved from their hometowns for work in the cities. These millions of people flock to metropolises like Beijing, Shanghai, or Shenzhen to find higher paying jobs than they could get at home. They spend most of their days in the city working long hours for salaries that net less than $500 a month on average. Half or more of that salary will be sent back to their families in their hometown. For most, the Spring Festival time is a nice respite from a long year of work, and a time to be reunited with family. Needless to say, this holiday exacerbates China’s ongoing transportation nightmares. China has invested billions of dollars over the last decade into building the world’s largest network of fast-speed trains, collectively crisscrossing China’s terrain with over 12,000km (roughly 7,450 miles) of High-Speed Rail (HSR). It has been an impressive achievement, and yet, according to Want China Times, the rail lines can only accommodate 220 million people, a mere 10% of Spring Festival travelers. China’s massive population continues to force the country to keep moving and continue building to accommodate higher demands for people to more conveniently transport between the big cities and the rest of China. It is for this reason that China is aiming to have 19,000 kilometers of operational HSR by 2015, averaging construction of 10,000 km of new rails lines annually over the next few years. For those of us living here, all we can really do is witness and experience the migration of millions of people at a time. Now, more than ever, it will need to innovate at a higher pace to keep up with a changing population with new concerns and higher expectations. Still, as we consider the meaning of Spring Festival for Chinese people, it ultimately is a time for family and tradition. The billions of journeys happening across China are not just about the hectic travel but also about the warm embrace of loved ones that have come from afar. It is Chinese tradition over the Chunyun holiday season to blast off fireworks on New Year’s Eve, and continue to do so every day until the seasons officially ends 15 days later. One of my fondest memories from living in China was experienced while at a friend’s hometown village in Northeast Liaoning province. Though the air outside was a chilly 35 degrees below zero, our hearts were warm as the tiny village lit up with fireworks that were being shot up dozens at a time into the cold night air. Huge gatherings of Chinese extended families come together at this time; it is not uncommon to have 30 or more relatives staying under the same roof for the holiday season. It is an amazingly warm experience filled with love and tradition that only comes around once a year. The Spring Festival is an essential piece of Chinese culture that must be understood and respected to really be an effective observer or businessperson in this complicated country. So if you haven’t already, go wish all your Chinese colleagues and friends a happy and bless Year of the Horse! While the mainstream media debates the future of the Chinese economy, the opportunist understands that China’s rapid economic growth path is only just now starting to bear fruit. We are at the beginning of a new chapter in the Chinese economy: the age of outbound private investment. It is no secret that during China’s historic economic rise, the country has made significant investments abroad. But up until just a few years ago, a vast majority of this investment was state-led. According to the Rhodium Group, from 2000 – 2011, 70% of China’s outbound investment was carried out by state-owned enterprises. The economic climate has changed drastically in a short amount of time. In 2012, private firms represented 80% of China’s outbound transactions, and just this year, private companies accounted for 16 out of 17 Chinese outbound M&A deals. Private firms are increasingly looking into more mature markets like the United States to grow their companies. Top industries of choice for Chinese firms include engineering and contracting, energy and mining, household appliances, automotive, and financial services. These types of investments save and even create jobs in the United States, further integrating our two economies and building a great pie. Recently, there have been a few high profile purchases by large Chinese companies. Last year, Chinese real estate and entertainment conglomerate, Dalian Wanda Group, purchased AMC Theatres for over $2 billion, and is gearing up to use it as a platform for further expansion into the U.S. market. Even more recently, China’s biggest pork producer, Shuanghui International, bought out Virginia-based pork producer Smithfield foods for $4.7 billion. These large-scale private purchases are merely harbingers of a greater trend of private investment and people flow between the United States and China. It truly is the dawning of a new age. Chinese individuals are more and more looking for ways to get their assets out of China. They are spurred not only by uncertainties about the future of the Chinese market, but also certain present realities. A great majority of China’s private wealth has been built on real estate. But now, in an effort to push down inflation and prevent a housing bubble, the Chinese government has been imposed strict regulations on real estate speculation. In Beijing, for example, the purchase of a pre-owned home is now subject to a 20% tax. On top of that, even owning a second home in Beijing has been banned for new buyers. There seem to be more changes on the horizon that are causing Chinese investors to look outward. The Chinese weibosphere (equivalent of U.S “twittersphere”) went crazy early in October when a State Council member announced that as part of the upcoming plenary session, the government is considered installing an inheritance tax. In light of all of all this, entrepreneurial Chinese are wasting no time figuring out ways to get around this by getting out. Emigration to the West has become a preferred option. Tens of thousands of Chinese high net worth individuals are emigrating every year. They see an American green card or other residency permits in Western countries as a safety precaution; a vehicle to make it easier to move money, and their families, out. Still, China does not make it easy on individuals to get their money out of China. According to Chinese law, an individual is only allowed to transfer up to 50,000 USD worth of Chinese yuan out of the country annually. That means that these investors need to be creative and use their network to move their assets into foreign markets. This bodes well for foreign financial firms and money managers that stand to grow a multitude of Chinese clients in this space. Currently, there is $4 trillion of private wealth sitting around in China. Astonishingly, only 7% of that is under management. That means over $3.7 trillion of Chinese wealth is unmanaged. Why is this the case? The concept of having third party management of wealth has only begun to emerge in China. In the Chinese economy, the guanxiculture that places so much emphasis on who you know that it makes people very unwilling to trust others, even professional financial managers, with their money. But now, the learning curve that comes with investing in foreign markets is now forcing Chinese to look to professionals to help them. In fact, if Americans can understand how new and untapped this opportunity is, an earnest effort to seek out and welcome private investment from China can help to resurge our economy and rebuild communities that need a kickstart. Americans and Chinese people are actual two sides of the same coin; largely what we know about each other is what we read in the newspaper. For that reason, it is no surprise that historically, individual investment in the United States from China has been concentrated in large, high-exposure markets like New York or Los Angeles. The tide could be turning, however, as more and more investors understand that those markets are becoming saturated. They are starting to look for answers elsewhere. Take Detroit for example. Although the Detroit market on the surface seems decrepit and failed, the Detroit real estate market has struck a cord amongst Chinese homebuyers. According to the United States National Association of Realtors, the Detroit market was one of the top 5 most inquired about markets amongst Chinese real estate buyers. This seemingly is an anomaly when considering the other markets that have historically caught the eye of Chinese such as New York and Los Angeles. In Milwaukee, we have been able to attract hundreds of millions of dollars through the EB5 program from Chinese investors. These people are becoming more sophisticated, understanding that the best, safest, and even potentially biggest boon markets in the United States are outside of the major metropolises that they have heard of. The time is now to start building relationships of trust directly with Chinese investors. The wave of outbound Chinese investment is only just beginning; the playing field is leveled. The question is, are you ready to ride the wave? Last weekend, American football came to Beijing! An organization called AFL China, which involves none other than famous footballer and ESPN Sunday NFL Countdown Legend Ron “Jaws” Jaworski, hoped to make the Arena Football League a popularly played professional sport here in China. On Sunday, November 10th, they hosted the first ever Arena Football League All Star Game at Capital Indoor Stadium in Beijing. And who does football better than the Big Ten? When the Big Ten Clubs got wind of this a few weeks ago, we were armed and ready to do what we do best: TAILGATE! It is really amazing what happens when a few people have an idea and just decide to run with it. Within 2 weeks, a group that included myself (President, MSU Beijing Alumni Club), Marco Reyes (President, U Illinois Beijing Alumni Club), Sylvia Liu (Purdue Beijing), and Tom Degregoris (Notre Dame Beijing) got together with the AFL China team to sell almost 250 tickets to the game through the Big Ten Network. 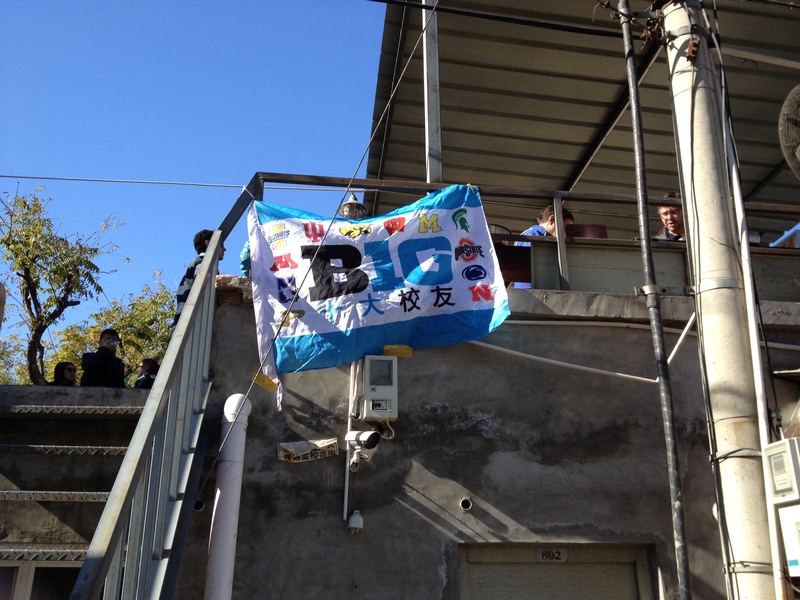 Then in the morning before the game, we hosted the first ever American Football Tailgate in Beijing. Over 100 people representing 20 universities came out for beer, sausages, and all the fixins of an America-style football tailgate. We believe it is the start of a great new tradition!! I’m flattered by a recent article posted in Dome Magazine by Tom Watkins highlighting my China journey. The article is called China Dan, and you can read the article on Dome here or read the whole text below. Truthfully, my global journey has been an amazing experience, but its a road that I do believe will lead me back to the Mitten state someday! There is much angst about the brain drain in Michigan. You’ve heard it: Our young college grads securing education, knowledge, skills and talent only to flee the state after graduation. Yet it is a big world out there, and Michigan has two beautiful peninsulas — we are not an island. Perhaps Michigan will benefit from the worldly experiences our youth gain elsewhere, if the magnetic pull of Pure Michigan can draw them back someday. I met one such young man, Dan Redford, in his senior year at Michigan State University. He flew the coop and now makes his home in Beijing, China. Dan is fluent in Chinese and bleeds “Green” as a proud MSU grad. Redford earned a bachelor’s degree with a double major in Chinese and international relations from James Madison College at MSU. Redford, now 25, originally wanted to get a political science degree and attend law school. That all changed after his first trip to China in 2008. Why China? He first fell in love with the language, and after his Middle Kingdom trip in 2008, taking in the sights, sounds, culture, language and people, he was hooked. The added excitement of the 2008 Olympics pulled him into the China orbit. Redford grew up in Frankenmuth, a town of 4,000 people – in stark contrast to Beijing’s nearly 20 million people. As he says, “There are nearly as many people in my Chinese apartment building as there are in the entire city of Frankenmuth”. Living in the Chinese capital, Redford feels like he is at the center of the most dynamic, unfolding story of the modern world. He clearly is, as China is the fastest growing large world economy, bursting with possibilities. Going forward, all major world geopolitical issues will intersect at Beijing and Washington, D.C.
Redford is director of China operations for First Pathway Partners of Milwaukee, promoting this Midwest state in China. Yet, he is a Michigan cheerleader, as well as one for Wisconsin, and a one-man marketing crew promoting the Mitten State with his unbound enthusiasm. Redford credits his time at MSU with helping to open his eyes to the world. His first trip to China was through a study abroad program. MSU taught him to “think globally”. Redford appreciates Governor Rick Snyder’s efforts to make Michigan a friendly place for immigrants and to build bridges. “Governor Snyder is taking risks to propel Michigan forward past denial and to thrive on the global stage,” he says. Sound advice from a young man who has circled the globe. Yes, Michigan has lost Redford for now. At some point in the future, he will return to Michigan and our state will get its ROI — return on investment — from his global experience and perspective. 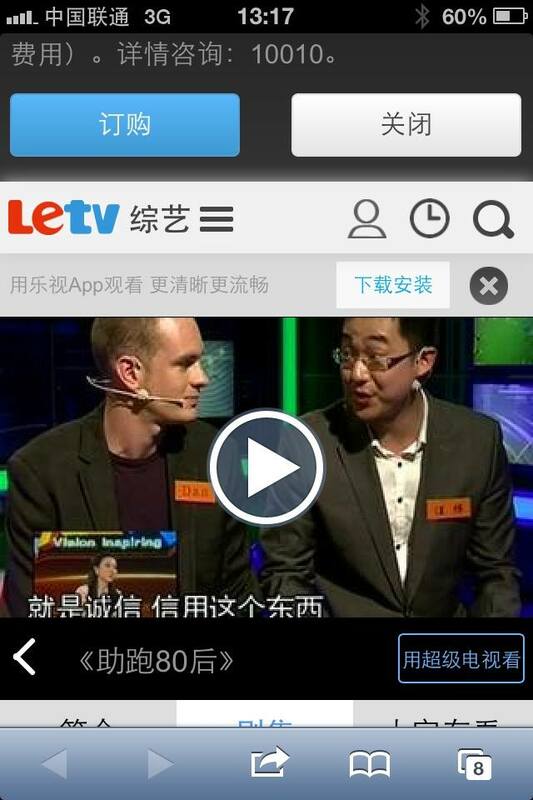 A few months ago, I posted about my TV debut on a Chinese television show called “助跑80后“ （The Road after 1980）。The episode was filmed in July, but was finally aired on Chinese Education TV, an affiliate of Chinese Central Television (CCTV) on October 24th. During the show, we interviewed the special guest, Fang Fang, Vice President of JP Morgan Chase Asia. It was a great experience, and I learned alot about how many Chinese young people approach the job hunting process in China. Chinese young people, just like Americans, often struggle to find a suitable job that pays a decent wage after college. We face the same pressures, and would do well to learn from each other. And once again, this was all made possible due to the MSU Network. The host of the show was introduced to me by her husband, Ray Wu, a good friend and graduate of MSU. Go Green! For over thirty years, China’s economy has been a disruptive and powerful force in the global economy. Now, China’s newly minted leadership has the challenge of managing this powerful economy as it shows signs of tiring. Problems of high inflation, rising property values, and a high level of bad government debt all threaten to throw China’s economy off track. Further privatization has been accepted as a way to combat these challenges, particularly in opening up government project contracts previously offered exclusively held by state-owned enterprises to the private sector. To really ensure effective privatization, China must develop a culture of innovation that gives Chinese people more ownership over the direction of this giant economy. China’s education system is a significant barrier to innovation. Unlike in the United States, where education involves a healthy mix of in-class testing and extra-curricular activity, China’s education system is almost 100% based on test scores. From primary school all the way through to high school graduation, Chinese students are preparing for the gaokao, a written test that each student takes after completing high school that will determine their collegiate path. It is a high-pressure system that forces students to focus on test scores and numbers, and does not foster creative thought. Even more constraining is the strong divide between social classes. This is not the first time in China’s history that the leadership has made sweeping statements about reforms in China’s economy. The question is, will people believe that they will become a reality? China is divided into three basic classes – laobaixing (common people), fuerdai (the rich), and tanerdai (government officials and colleagues). These differences are so pronounced that it is hard for Chinese people to imagine any reforms that would change their relative position within this system. These two aspects of Chinese society deter innovation, evidenced by a marked increase in dissatisfaction by average Chinese citizens in this economy, and an exodus of China’s rich, would-be innovative class. Since moving to Beijing in 2011, I’ve witnessed the attitudes of average Chinese people go through a steady change. For common people, pride and excitement in China’s economic growth are gradually being replaced with disappointment and resentment. Last week, I had a cab driver ask me if the U.S. would consider liberating China instead of Syria. Why? This change in attitude is growing along with divide between rich and poor. The government understands the severity of the problem. In January they released the official Gini Coefficient, which measures income disparity within an economy, for the first time since 2005. The Chinese claim that the number sits at .474, though a majority of independent assessments from scholars put the number over .6. Both numbers are over 0.4, which is considered a standard breaking point at which society as a whole starts to turn from generally satisfied to generally unsatisfied. These statistics play out in China’s cities where working class citizens and migrants work and live in close proximity to the wealthy and powerful. Last year it was announced that over 51% of China’s population lives in urban areas, and China expects to enact plans to make that number increase to 70% by 2025. Unfortunately, with limited education and poor platforms for social mobility, the cities are being filled more and more with people that are not in a position to offer innovative value to a society that needs it. At the same time that migrants and low-educated people are growing their presence in China’s economic hubs, certain habits of the educated and wealthy indicate a need to create incentives for innovation. One of these habits is emigration. In a 2011 survey of Chinese citizens with net worth of over 10 million RMB ($1.53 million), it was discovered that over 60% said that they were considering emigrating from China. The survey, developed collectively by Bain and Company and China Merchants Bank, shows that the wealthy in China are either not sure about the trajectory of China’s future, or that they are just generally dissatisfied. One thing is clear is that they are not willing to stick around to spend time investing and innovating in the Chinese economy. In China’s new era of privatization, the leadership should frame the reforms around giving average Chinese people incentives and resources to “dare to dream.” They will find ample opportunities as they start to open contracts previously held exclusively by state-owned enterprises to private companies. These large contracts should be given not just to those with government relationships, but those that demonstrate that they can give the best performances. Over time, this will provide evidence to Chinese people that society is indeed changing, and that taking a more entrepreneurial path could be an acceptable track to achieving a better life in China. Eventually, this will give the government teeth to actually reform the gaokao-based curriculum and encourage a balanced education system that gives Chinese people the incentives to think outside of the box. This is how to create a healthy economy that depends on and fosters innovation within its people. Dan Redford is the Director of China Operations for FirstPathway Partners, and industry leading EB5 immigration fund manager. He also serves as the President of the Michigan State University Beijing Alumni Club. You can follow him and his perspectives from China at http://www.danredford.com. As it is every day, it is GREAT to be a SPARTAN. I am so proud of my friend, colleague, and professor, Dr. Geri Zeldes of Michigan State University for producing and directing a great documentary about the experience of Chinese students at MSU, Imported from China. The documentary featured the journey of a few Chinese students at MSU, along with American students that reflect on their interactions with the influx of Chinese in our community. It premiered at MSU on September 17th, and will soon be distributed widely. I believe it will be a great tool for any university or school that is experiencing an influx of Chinese students and is looking to serve them better. I am honored to have been interviewed and included in the documentary, along with some of my other respected and dear friends, including Jing Cui, Tom Watkins, Peter Briggs, and Joy Fu. MSU is currently home to over 3,600 Chinese students. This puts our university at the heart and center of one of the world’s most dynamic and unfolding stories – the one between China and the U.S. As the documentary says, “Like it or Not, we are linked together.” At MSU, we are creating leaders of a generation that I believe will guide us through a prosperous and fulfilling modern U.S. – China relationship. If you are interested in screening this video at your school or for your alumni club, please contact me and I can put you in touch with Geri. Two years ago, Governor Snyder came to China to start building a relationship almost out of nothing. At the time, it had been 11 years since a governor of the state of Michigan had come to China; Snyder vowed to reverse this trend and put Michigan back in the game to attract business and investment from this economic giant. On Friday, Snyder and a delegation of 60-plus Michigan business owners and MEDC representatives left China after his now 3rd consecutive trade mission in as many years. As a Michigander that has been living in Beijing since the governor made his first trip, I am amazed and encouraged by the progress that has been made. Last year, the trip was headlined by the opening of the Michigan China Center in Shanghai, and this year, the governor took the message of the “Comeback State” on the road to Beijing, Shanghai, and Chongqing. The delegation itself has matured greatly from two years ago. It was exciting to mingle with so many high quality Michiganders at the governor’s reception in Beijing and see the hope and excitement they have being introduced to business in China. Although auto-related companies still represent the lion’s share of stakeholders in the bilateral relationship, this year’s delegation had a larger presence from service providers in a variety of industries. Terry Terry, President of Lansing-based video production and event management company MessageMakers, came with the delegation to not only film the historic visit but to also identify partners in China to grow his global business. It was clear that real business was done on this trip. Prior to the Beijing reception, timber manufacturer and designer Morabark Industries of Winn, MI signed an agreement with a Chinese partner to formalize a business collaboration that will bring jobs to both Michigan and China. Snyder’s efforts are clearly helping the name and reputation of the “Pure Michigan” brand spread very quickly in China. During this trip, he secured a meeting and press conference with China’s Vice Premier Wang Yang, in which both agreed that there were a myriad of opportunities for a state like Michigan to collaborate with China. The Mayor of Chongqing, Huang Qifen, seemed to agree, penning a memorandum of understanding to build stronger economic ties between the city of 30 million people and Michigan. Government meetings at that high of a level would have been impossible two years ago. What is even more amazing is the quality of the contacts the state has built in the private sector as well. In Beijing, the governor led the MEDC in meetings with the Chinese giant entertainment and real estate conglomerate, Wanda Group. Wanda group is growing into one of the largest and fastest growing private companies in China; last year, Wanda bought AMC Theaters for $2.6 billion, and is gearing up for huge foreign investment projects in the U.S. and throughout the world. The fact that Snyder’s team has at least put Michigan on the radar shows that Michigan is starting to get taken seriously. Congratulations to Governor Snyder and this year’s trade mission for a successful trip! Please remember there are still thousands of Michigan resident expats here in China that are proud of where we come from, and are looking forward to helping contribute to building the Pure Michigan brand in China! Obviously, we need to see some real business deals signed that bring home jobs. There are at least 30 delegates going on the trip with Snyder, and I hope that at least one of them, such as Lori Huisman of Classic Design Concepts, can benefit from associating with the governor on this junket with a real business deal. It sounds crazy, but the state of Michigan does not even have a standard name in Chinese. There are at least 3 popular versions throughout China, but the state itself has never made it a point to standardize. The name 密西根 (pronounced mi-shee-gen) is the best choice and is already being implemented at the Michigan China Center in Shanghai, Michigan’s official office in China. This will greatly help George Zimmerman, Director of Travel Michigan, and those of us Michiganders in China helping to promote our state! Quartz.com, and many other news outlets, commented about how Chinese have been going crazy over cheap buys in the Detroit Real Estate market. According to Fox News, though, many were unable to make purchases because they were denied visas to the United States. Ouch! With almost 30 million people, Chongqing is China’s largest city. Lucky for Detroit, it is already sister cities with this giant! Snyder should re-ignite the sister city relationship by signing an MOU with their new party chief to work towards sustained collaboration. (Ironically, the Party Chief of Chongqing was sacked last year in a corruption scandal and recently went on trial…I guess you could say there are some similarities between the two cities?). There are thousands of Michiganders and Chinese with Michigan ties that are ready to serve on the front lines to change the narrative about Michigan in China. We have access to corporate CEOs and government officials that we’ve worked with during our time here – – commission us to start a “Detroit Dialogues” series to get people talking about the realities of Detroit and Michigan. Consider this my application to volunteer! 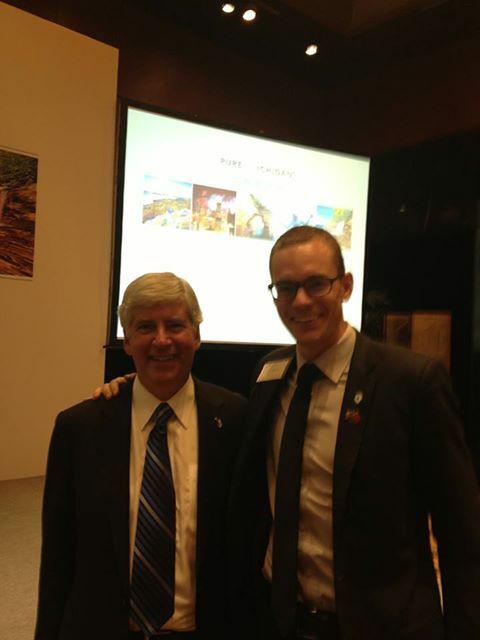 Good luck to Governor Snyder and this year’s trade mission! 中国欢迎您！Welcome to China!